How can we move away from “us vs. them” thinking as our surroundings feel more divided and polarized than ever? Tibetan Buddhism and Mystical Christianity answer this question from unique points of view, with many commonalities and practical tools to break down the barriers between us. 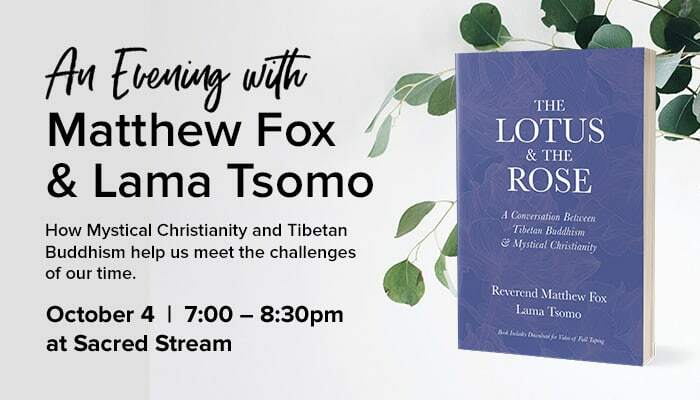 Matthew Fox and Lama Tsomo have both taken less-traveled spiritual paths, giving them a fresh perspective on how faith can help us face the challenges of today’s world. Whether you follow a tradition or just enjoy exploring the world’s religions, you will be drawn in by these remarkable friends and the weave and depth of their stories. Why The Lotus & The Rose? From Lama Tsomo: The Lotus has great symbolism in Buddhism. It has its roots in the muck of a swamp or pond, yet its flower is pristine—unsullied by the muck—and faces the sky. This represents us as human beings, being able to span such vast levels of consciousness, of being. From Matthew Fox: The Rose has several meanings within the Christian tradition. A rose exists…to be a rose…and that seems not only sufficient but wonderful and special. Roses do not last long but they do display their beauty of color and smell and geometry with abandon—generously we might say. And we too are invited to live without a why, live in order to live and love in order to love and work in order to work.